Air101: Sikorsky Delivers Production Number 300 S-92® Helicopter to Era Group Inc.
Sikorsky Delivers Production Number 300 S-92® Helicopter to Era Group Inc.
Sikorsky, a Lockheed Martin company delivered the 300th S-92® helicopter. Era Group Inc. signed for the aircraft, configured for offshore oil worker transportation, in a ceremony at the 2018 Helicopter Association International Heli-Expo. This aircraft, assembled in Coatesville, Pennsylvania, will join Era Group's fleet of eight Sikorsky helicopters and enter service in March in the Gulf of Mexico. In 2016, Sikorsky recognized Era Group for being the first operator to enter revenue service with a Gross Weight Expanded (GWE) S-92 helicopter. The GWE increases the maximum take-off weight of the S-92 helicopter from 26,500 to 27,700 pounds, increasing the available payload by 1,200 pounds that can be used for passengers or fuel. The addition of this aircraft marks Era's fourth GWE S-92 helicopter. 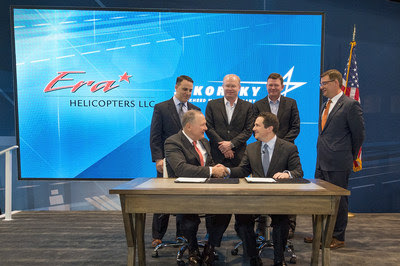 "In the year of Era's 70th anniversary, we are thrilled to enhance the safety and availability of our fleet with another Sikorsky product," said Era Group President and CEO Chris Bradshaw. "The reliability of the S-92 provides the consistency our mission requires, and when minutes matter, Sikorsky's world-class customer service provides the support we need." "Sikorsky and Era have partnered for more than 60 years, beginning with Era's operation of the Sikorsky S-55 in 1956. Since then, Sikorsky has been honored to be a part of Era's mission of providing safe, efficient and reliable transportation," said Sikorsky President Dan Schultz. "We've had a rich history together, and with the delivery of this aircraft, we look forward to an even brighter future." The S-92 helicopter has become the industry's standard. It leads the way in compliance with the latest U.S. Federal Aviation Administration and European airworthiness safety standards by meeting or exceeding oil and gas industry requirements. With more than 1.25 million fleet flight hours of service, the S-92 helicopter sets the standard for safety. These aircraft perform a variety of missions including offshore oil transportation, search and rescue, Head of State and airline missions.